LOS ANGELES (Sept. 3, 2013) - Beating Michael Jackson for the record of the youngest performer ever to headline a solo tour, Ethan Bortnick is a global phenomenon. He started playing the piano at the age of three, composed his first song at five years old and set the Guinness World Record for becoming the youngest headline entertainer at the age of six. Now at the age of twelve, he sets another milestone as one of the youngest performers to star-in and co-compose the music in a film - Anything Is Possible . Distributed by Image Entertainment, an RLJ Entertainment (NASDAQ: RLJE) brand, Anything Is Possible takes audiences on a heartwarming journey that will make them laugh, cry, and believe all at the same time. The movie will be available on DVD on Sept. 24, 2013 at SRP of $27.97. Directed by Demetrius Navarro, Ethan stars with Jonathan Bennett (Memorial Day, Mean Girls) and Lacey Chabert ("Party of Five," Mean Girls). A family shattered...a children's home in jeopardy...a wounded heart...and kids on a mission to make a difference. These powerful elements spark gripping drama, suspense, comedy, love and a beautiful soundtrack co-written by Ethan with Grammy Award-winning Songwriter and Producer Gary Baker. Ethan plays Nathan, a young boy who becomes separated from his mother, Army Lieutenant Margaret Peters (Chabert), when she goes missing during a tsunami rescue mission in Japan. Back home in Detroit, Child Care Services threatens to take Nathan away when it was revealed that his dad George (Bennett) isn't his biological father. Nathan runs away, but through the help and support of the strangers he meets along the way - including a homeless Iraq-war veteran, a wealthy philanthropist and kids at the local orphanage - he discovers his musical gift, a sense of belonging and his true purpose. Ethan has a new PBS concert set to premiere this December. His last PBS special, "Ethan Bortnick And His Musical Time Machine" aired more than 700 times! An entertainer and a humanitarian, Ethan has raised more than $30 million dollars for a variety of charities including the one closest to his heart, Children's Miracle Network. Ethan has been a repeated guest on The Tonight Show, The Oprah Winfrey Show, Good Morning America, as well as national news and entertainments shows in Canada, Brazil and Australia. Despite sharing the stage with superstars like Beyonce, Natalie Cole, Nellie Furtado, Smokey Robinson and Patti La Belle, Ethan tells Oprah Winfrey during an interview about talented kids that, "We still have to stay humble." 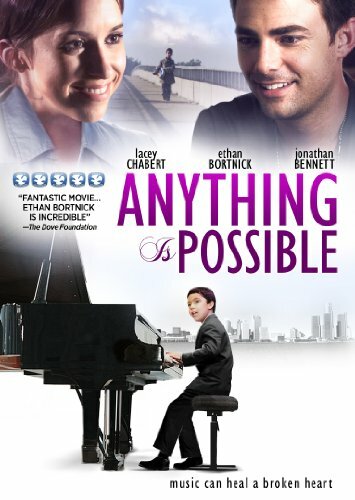 Anything is Possible was Produced by Demetrius Navarro and Enrico Natale and Executive Produced by Pastor Marvin Miles. Pastor Miles hosts TCT Television Network's Detroit Connect, which reaches several million people worldwide. He is president of the Charles O. Miles Senior Non-Profit Housing Corporation, the entity under which Miles Manor, International Gospel Center's 37-unit senior complex, sits.